The proper configuration of our Internet connection and some of the options that our operating system has, can provide an interesting improvement in the performance of applications like browsers or P2P programs. 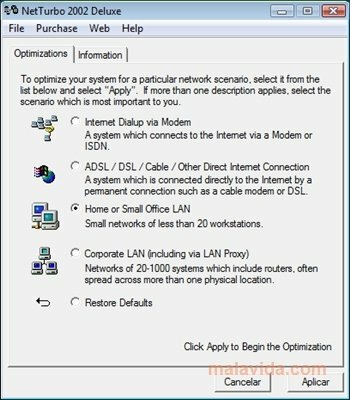 In this way, it is possible to make the most of the bandwidth that your ISP offers, and enjoy the maximum download speed. NetTurbo is a simple utility that allows you to improve the speed of your Internet connection in a single step. From the application's interface, we will only have to choose one of the options that are available and press the "Apply" button. We can go back whenever we choose to do so by pressing "Restore Defaults". 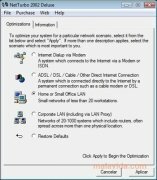 This utility automatically performs a great amount of adjustments to the operating system (Windows 2000 or Windows 98) that significantly improves its performance when we make use of our Internet connection. With NetTurbo 2002 Deluxe you'll be able to optimize the system to increase the speed of your Internet connection, whether by telephone line (Dial Up), ISDN, ADSL or cable modem. What's more, it is valid both for simple connections as well as small LANs or corporate networks. This is a trial version that lasts for 30 days. Runs on Windows 2000 and Windows 98.